Windows 7 Theme iBaked contains 5 various visual styles, 3 fonts, Custom Start Orb, Rainmeter Skin, CD Art Display Skin, explorerframe.dll, shell32.dll. In one sentence a full set to customize windows 7. 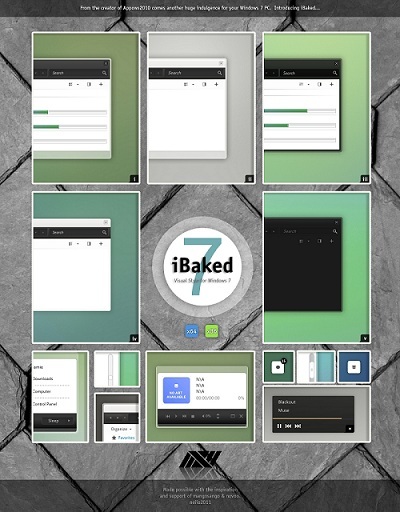 Windows 7 Theme iBaked is created by neiio. Run Windows 7 Theme iBaked using Administrator rights with UAC turn off. Right-click the .exe file, select Run as Administrator. Take ownership of explorerframe.dll & shell32.dll in C:WindowsSystem32 folder and copy over the originals!. Make sure to make a backup of the originals first in case of system instability. After patching, restart your computer for the changes to take effect. The installation process of Windows 7 Theme iBaked is written by the developer. We have not modified it. Click here for a bigger preview of Windows 7 Theme iBaked. Windows 7 Theme iBaked is a 7z download, the file is 17.6 MB in size. This Article Has Been Shared 4611 Times! Windows 7 Theme Noche is Fresh Visual Style For a clean, minimalistic Windows 7 Desktop. Great designing and added tutorial by the developers makes it unique. Windows 7 Theme Sereno is a visual style with minimalistic frosted glass appearance. The themes available for both of the two versions of Windows. Cite this article as: Abhishek Ghosh, "Windows 7 Theme iBaked – Completely Customize Windows," in The Customize Windows, September 15, 2011, April 25, 2019, https://thecustomizewindows.com/2011/09/windows-7-theme-ibaked-completely-customize-windows/.